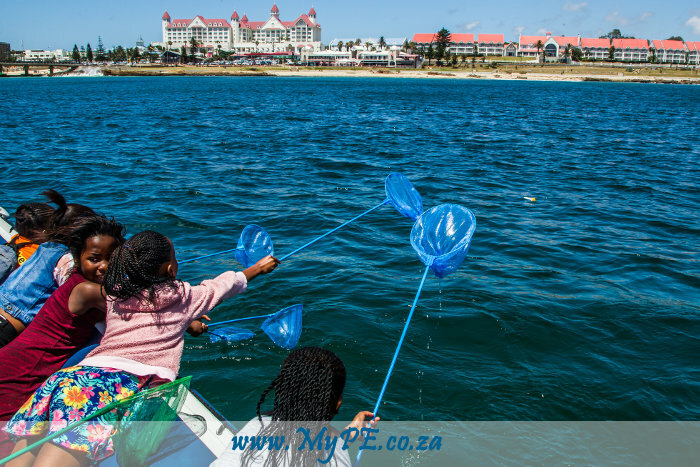 Local Port Elizabeth based Marine NGO, Ocean Messengers, teamed up with Walmer based Masifunde Learner Development to highlight the dangers of plastic in Algoa Bay. “Plastic is the oceans and our environments worst enemy! That plastic bottle that you drink water out of and throw away will take longer than your lifetime to ‘decompose’ – 450 years in fact. BUT, plastic does not decompose like a leaf or other animal matter – it just breaks down into smaller and smaller particles which animals and humans breathe and ingest,” said Ocean Messengers representative, Rainer Schimpf. Plastic Gyre’s – massive floating plastic ‘islands’ are formed in the ocean – the Pacific contains a floating mass of plastic and micro plastic almost half the land mass of South Africa! Known as the “North Pacific Gyre” it contains objects like tires, fishing nets, lots and lots of plastic and plastic bags. The average South African uses between 800 and 1000 plastic bags every year which are often mistaken for food by hungry birds, seals, sharks, dolphins, whales and sea turtles. Plastics contain toxic chemicals, which are dangerous to fish and other sea life that often swallow plastic. Micro Beads of plastic are used in facial scrubs and toothpaste that we flush into the sea. “The best and most visible method of education is by physically removing the plastic from the sea and shores of Algoa Bay,” sadis Schimpf before setting out to sea with learners from Masifunde. Tackling this problem on a global scale is Boyan Slat who, as an 18 year-old in 2012 proposed a method to clean up the gyres using ocean currents. In his TEDx Delft talk Slat even proposed that the clean up and on selling of collected plastic could result in a profitable venture. More Must See in PE suggestions.